In the category of Going against the obvious choice, (much like my preference for Grieco over Depp, which actually was period related, in that, i'm no fool in 2007—I'd choose Depp) i was a Roland (yes, look right) girl. Deciding I needed to take a break from searching YouTube for every obscure Neil Finn-related clip I could unearth, I was looking over Celebrity Playlists on iTunes because my friend Lisa McG (fellow musically obsessed soul mate and all around rad chick) told me to check out John Cusack's list. Which got me lost in celeb lists, looking for, you guessed it: those who liked Neil. Only ONE band had a single Neil song: Death Cab for Cutie. Nice. 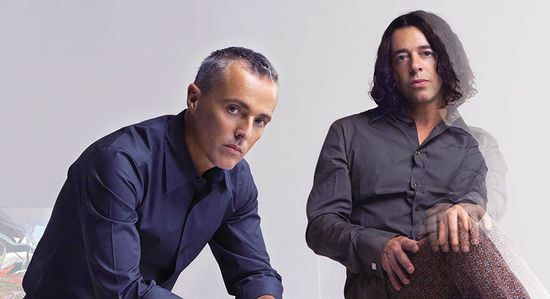 But while looking, someone (and i can't remember which fabulous celebrity it was) listed a song by Tears for Fears, Woman in Chains (see link on my new link list), and that got me to search my own iTunes library, to listen to a band that, for a time, was my favorite band in the world. I really believe if they hadn't broken up, (from their original form) they would have continued to take over the planet. Although I personally loved the TFF albums without Curt. Because I am a Roland girl. Why? Because when he sings, he means it. That's really all it takes for me to get hooked. If they mean it. That's why i'm breaking my usual pattern of NOT listening to female artists and putting Brandi Carlile on from time to time. She bloody MEANS it when she sings. So I'm lost in nostalgia right now. I actually saw TFF on their comeback tour a few years back. New album is actually good. So was the show. But it's not like Neil love or anything. ugh… that remake is not a TOUCH on the original.. rock on RADIOHEAD! OMG they look old – my memory of them is from the MTV videos..they were one of my faves too…saw them in concert…I loved Curt though..liked The Working Song – I think that is the name, I haven’t listened to one of their CDs in forever. It’s gonna be HOT! HOT! HOT! here in Salt Lake! We’re supposed to hit 101 tomorrow! OMG–i LOVE Brandi! my friend david (quite the singer/songwriter himself, so he should know–and here’s a shameless plug for him–http://www.david-greco.com) introduced her to me a few weeks ago–and i couldn’t quite find the words for WHY she’s so amazing (other than the fact that she’s got a MAGNIFICENT voice, of course! ), but you have NAILED it. she means EVERY word she sings. FABULOUS! I am a RO girl all the way! I have seen TFF in concert 3 times: Elemental our, the Kings of Spain tour, and the most recent tour where the lads reunited. It was amazing to see Curt & Roland on the stage together again! I LOVE Roland’s work without Curt, but it was awesome to hear them sing together again. If you haven’t checked it out, give a listen to Roland’s solo album “Tomcats Screaming Outside” (the only one for which he dropped the TFF name). It’s really great stuff–very different, but I love it. And I agree–that man’s VOICE…sends me into shivers! It is gorgeous. Woman in Chains shows off the range and richness of Roland’s voice magnificently! I have to say- that song Creep? Well, it was my cousin’s FIRST DANCE song at her WEDDING! There was a band covering it (as opposed to a DJ playing CDs) and once I realized what it was, I was, um, shocked. And then I wondered as they got to the chorus- which version are they gonna sing? I mean, you think you would know, but then again, you don’t expect that as a first dance song, either. It was, um, a little strange. And no, no f-bombs, thankfully. Don’t know if grandma could have taken that! Cathy, thanks for the laugh. I enjoy reading your blog, you just make me laugh and I can totally relate to the front row, no ticket fear. For me it was the Goo Goo Dolls (who I’ve seen 6 times) this spring, I kept checking to make sure I had the tickets with me the whole way there, good thing it was close by…in case I forgot them! Thanks! Funny, you mentioning Tears for Fears reminds me of the day I picked up the single tape for Break It Down Again. I drove my college roommates absolutely berzerk because I played that one song so many times. While I certainly knew who TFF was, I had never paid attention before. This one song is still the one I think about whenever I hear TFF mentioned. umm… think I went to the first EVER TFF gig (Margate Winter Gardens, UK pop pickers, but I am prepared to be corrected by better fans that I). Does that make me incredibly old or incredibly cool? ahhhhhhhhh…so many fond memories of TFF back in the day. I was a Curt girl, but I did love Roland’s passion…NOT the dancing, poor thing. Have a great weekend!! I too am a Roland Girl. I too love Brandi Carlisle. I heard her first on the soundtrack for the Sisterhood of the Traveling Pants. (shh!). You might try Chantal Kreviazuk or Anna Nalick if you haven’t already…. Ok wait.. first you mention John Cusack and then Tears for Fears… I don’t even know how to search celebrity play lists or whatever you were talking about, but I’m sure that by the end of the day, I’ll have it figured out. John Cusack is the only permanent member of my “fantasy island.” And just recently I decided Bon Jovi (Jon? oh crud…I’m horrible with names..I’m not ocd about them like you are…) anyway after he was on American Idol… I sent him to my fantasy island. He still looks hot!! But even more than that… can’t you just see them hanging out together? You are such an enabler!!!! Brandi Carlyle’s voice comes up when you go to my blog. I love her. I discovered her when she opened for my last obsession – Train. She mentioned that she had just found out that day that her song was going to be on “Grey’s Anatomy” and between her song and Kyle Chandler saying he was on it I rented it and got incredibly hooked. Such good connections. Oh man, I love TFF. They’re on a regular rotation in my house. My poor kids–they don’t realize that there has been much music made since the 80s. Oh well. oh, and my hubster says my gfs and i are all a little cracked, living in the 80s (one is a duran duran freakishly-fanatic-fan). but i say those were good times, when we had not a care in the world- kidless, mortgage-less (and sometimes foodless, lol!). . . I loved TFF back in the day, but was not a big fan or Roland’s hair. I was very superficial as a teen (aren’t we all)! LOVE, LOVE, LOVE the song Creep by Radiohead!! Always reminds me of my Best Friends Older brother who made a mix of music for me on a tape (this was back in the day of course!) and had this on it! That was a strange dream you had! Don’t lose your tickets, hold on tight to those babies!! Am I the only person who hears ‘Creep’ and cringes? Honestly, not the best Radiohead song, no matter who tries to make it better. TFF was my very first concert 🙂 I think it was a present from my dad for my 13th birthday. lol It was great! I don’t know if you knew about this, but I just noticed your link to “Business Time,” and HBO has a series called “Flight of the Conchords.” I saw my first episode last week, and it was hilarious. Love those guys! Just love your blog! I went to see TFF here in Austin on their last tour and actually got to watch the entire thing from the side stage and then hang out a little with Roland and Curt after the show. Amazingly nice guys. I was such a geek I had to get them to sign my ticket stub! Roland was hilarious and very chatty. Curt was very dry witted and a little more subdued than Roland. Shared a good cold beer and about 15 minutes! So cool. My sister got us the backstage passes. She gets stuff like that all of the time. She has met more singers/musicians than you can imagine–lucky girl–and no, she’s not a groupie! Also, if you haven’t seen Flight of the Conchords on HBO, you MUST! i used to absolutely LOVE them…didn’t realize they did another album. Woohoo I am a Roland girl too! Saw the Elemental tour in HS and fell in love! One of the best shows I have ever been to. Now I wanna go find my TFF CD’s! Watched the Mother’s Work video – so so funny. My mom used to dance like that at parties, and I remember being verrrrry mortified. Maybe my screen resolution isn’t what it should be, but was that Jon Cryer pretending to be Roland? I laughed out loud. Thanks for starting my day off right. Hoooly CRAP. With one post you took me back to my mis-spent youth. First off, I still lust after John Cusack (what I wouldn’t have given to be Ione Skye in “Say Anything”…jeez louise. I try to avoid the evil overlord i-tunes whenever possible but now must go see his playlist. Enabler. And I too was a Roland girl in my day. I saw them live at Madison Square Garden way back in my Aqua Net days. If you haven’t yet, check out Gary Jules and his remake of “Mad World” – I came across it on an episode of “CSI” ages ago, and downloaded it…of course it pales in comparison to Roland, but not a bad take on a classic. Hope you’re having a great weekend! Hi, read your blog daily but first time commenter. Live in SLC, and my husband knows who you are because I talk about you like we’re friends. I’ll say, “Cathy is in Salt Lake this week.” He’s gotten pretty used to it now. Anyways, there’s a movie called “Once” that you HAVE to see. You love music and you will love this movie. It’s a love story, and it’s a musical (but not in that cheesy Chicago kind of way). It’s raw and it’s beautiful. You’re in SLC this week and it’s playing at the Broadway Theatre in town. Watch it, love it, email me and let me know if you cried. I did. Have I told you that I LOVE that you’re my age? 🙂 I love to reminisce with you over the net. Here’s another ‘obscure’ Neil Finn article – from our local(New Zealand) Sunday paper. I knew when you mentioned Howard Jones that we were soulmates (har har – that’s not creepy at all), but now you’ve just confirmed it with your love of TFF and Roland. Aahh, nostalgie quand tu nous tiens! But I prefer the guitar riff on Everybody wants to rule the world…. my favorite all time song is CREEP.. i love love love radiohead.. i think a new album is in the works soon..
You brought back many good memories, Cathy! Thanks 🙂 I love TFF music! I’m laughing as I read your blog tonight because I’m right there in the moment. Oh the 80’s, sigh… Why are we so anxious to grow out of an era but sooo nostalgic for those times and tunes years later? Love your thoughts…daily!!! Love that you continue to provide a “cool chick” universal memory for all of us that seemed to have grown into “scrapbooking moms.” Did I blink? When did that happen???? When did the 80’s become back in the day? I’d put quotes around back in the day (twice) but am fearful of becoming too quotalishish with my blog comment. Like that girl with the guitar in Say Anything!!! Notice no quotes for the title of the movie either 😉 Rock on funny girl! Love your blog. We are the same age, so I so relate to your musical choices. The other day after reading about CH (I loved them, not too familiar with the new stuff) I had one song in particular stuck in my head all day long!! All your fault! haha Drove me nuts! Man, loved TFF too. How about Level 42? Loved them too! Ah,good memories, good memories. I personally adore Howard Jones..
well, that’s a relief – i can have Curt all to myself. esp now that he has lost the skinny braid (euwh). thanks for bringing tff back to mind, gonna go dload some greatest hits. Guess I’m kind of your counterpart here in the UK. I’m Art Editor on Scrapbook inspirations magazine. Quite spookily we are based in Bath, the home of the Tears for Fears boys (well they were boys when we were girls, and I for one am holding on to that!). In another twist of fate Neil Finn also rocks my world and so I have included a link to a very recent Crowded House session on the Beeb that I hope you manage to connect to. Speaking of Grieco…totally my fave, too. So you must have been a “Booker” fan! I remember driving back to college after break and getting stuck in traffic, knowing I was going to be late and miss it. This was waaaay pre-DVR, and we didn’t even have a VCR to tape it – waaahhhhh! Seriously, I did actually weep. Oh, how I loved him so.